The International Space Station's full Expedition 23 crew speaks with family members and official representatives from Russian and the U.S. on the ground after a Soyuz docked with three new crewmembers on April 4, 2010. CAPE CANAVERAL, Fla. ? Easter may be a time ofreflection, rest and egg hunts for many people around the world, but it?s turnedinto a space traffic jam for astronauts headed for the International Space Station. NASA is planning to launchthe shuttle Discovery and seven astronauts toward the station before sunrisetomorrow, Easter Monday, on a flight to stock up the space station withsupplies, new science gear and vital spare parts. Liftoff is set for 6:21 a.m.EDT (1021 GMT) from a seaside pad here at NASA?s Kennedy Space Center. Meanwhile, a RussianSoyuz spacecraft arrived at the station early this Easter Sunday morning todeliver three new astronauts to join another trio already aboard the orbitinglaboratory. The Soyuz launched on Good Friday from Baikonur Cosmodrome inKazakhstan. NASA engineers worked through the weekend despite the Christian holiday in order to readyDiscovery for its morning launch into orbit, which may be visible (weatherpermitting) to observers along the United States East Coast [howto watch the shuttle launch]. ? ?Even though it is Easter Sunday, it?s just like anytypical?countdown timeline,? said NASA test director Pete Nickolenko. ?All the standardactivities are just like they would be per that nominal timeline.? Even so, Nickolenko did instruct his teams to double checkto make sure there were no schedule conflicts. There were none. ?Folks are very excited,? Nickolenko said. 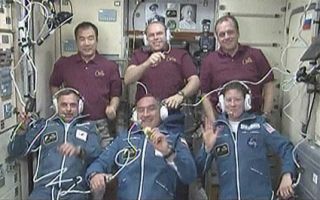 Up in space, the stationastronauts marked Easter with a standard video link with loved ones,friends and space officials at Russia?s Mission Control center near Moscow. ?We are under a great impression of this flight and wehave a lot of emotions,? Russian cosmonaut Alexander Skvortsovtold Mission Control. ?And we would like to again say ?Happy Easter? toeverybody. It?s a wonderful holiday.? Skvortsov arrived at the station alongside Russiancrewmate Mikhail Kornienko and American astronaut Tracy Caldwell Dyson of NASA,all of whom sent Easter wishes to their loved ones on Earth. But they were alsoeager to get to work. ?I also want to say ?Happy Easter? to everybody,?Kornienko said. ?We hope that tomorrow the shuttle will be launched and that onthe 7th of April, we hope that we?ll have a successful docking.? Russian space officials in Moscow said that the spacestation astronauts did not have any Easter eggs or Kulich ? a Russian breadtraditional eaten during Easter ? with them in orbit. But they could celebratethe day in spirit, they said. SPACE.com is providing complete coverage ofDiscovery's STS-131 mission to the International Space Station with ManagingEditor Tariq Malik in Cape Canaveral,Fla., and Staff Writer Clara Moskowitzbased in New York. Click here for shuttle missionupdates and a link to NASA TV.